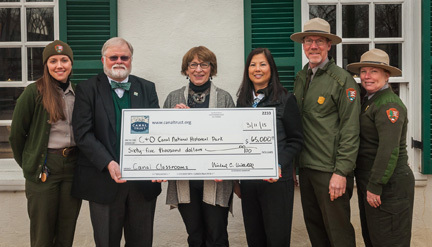 On Wednesday, March 11, 2015, the C&O Canal Trust presented a $65,000 check to the C&O Canal National Historical Park (NHP) in support of their Canal Classrooms education program. C&O Canal Trust Board Chair Michael C. Mitchell presented the check to C&O Canal NHP Superintendent Kevin Brandt at the Great Falls Tavern in Potomac, Md. The Canal Classrooms program is the C&O Canal NHP’s education program, currently in its third year. This scalable program has the potential to provide tens of thousands of school-aged children with the chance to use the Park as an outdoor classroom, where they will learn through experiential opportunities that utilize national and state standards; curriculum that includes Science, Technology, Engineering, Arts and Math (STEAM) concepts as well as history lessons; and the integration of technology. Canal Classrooms served 9,000 students last year and plans to increase this number every year as the program capacity grows. As the official nonprofit partner of the C&O Canal National Historical Park, the C&O Canal Trust donated $50,000 to the program last fiscal year, money that will support the continued development and implementation of the Canal Classrooms program at Great Falls, serving primarily Montgomery County students. Hallmarks of the program include a flexible staffing model that pairs retired teachers with Park Rangers to deliver education programs in the Park; the development of an integrated curriculum for elementary, middle, and high school students; and a Transportation Scholarship Fund that pays for bus transportation to and from the Park. The program currently is operating in Washington and Allegany Counties, and is being piloted in Montgomery County this year and next. The C&O Canal Trust raised the $65,000 from individual donors and foundations. The March 11 check hand-off took place during a presentation to donors about the progress of Canal Classrooms and plans for the program’s delivery at Great Falls. Additionally, donors were able to observe a training session for the Canal Classrooms Corp, the cohort of retired teachers preparing to lead educational programs for the Canal Classrooms program. The C&O Canal Trust is the official non-profit partner of the C&O Canal National Historical Park, and a 501(c)(3) charitable organization. For more information about the Trust visit www.canaltrust.org.